Eric "Eugenics" Worrall** vacillates between vacuous and contemptible. Today he's decided to do another smear job on Professor Tim Flannery (archived here). He thinks he can get away with it because he's using the disinformer's trick of linking to someone else telling the same lies. This recycling of five year old denier memes doesn't mean deniers are running out of puff. They have an endless capacity to recycle disinformation. In fact it's all they've got. Lesson 1: One of the first lessons disinformers learn is how to cherry pick quote mine. That means taking anything from one word to ten from a blog article, a stolen personal email, a scientific paper or even from a video transcript and putting them in a different context of your choosing. In other words, distorting at best but usually making something up altogether and then falsely attributing it to the person you want to misrepresent or defame. Lesson 1a: The variation in use today is to link to some other source of cherry picking quote mining to twist and misrepresent. Now that deniers do defamation for a living there are a lot of websites they can link to where people tell lies. Some like Andrew Bolt misrepresent facts for a living. He gets paid handsomely. The Eric Worralls of the world are mere footsoldiers and work for free. Just this week I've shown two other people at WUWT who've put Lesson 1 or Lesson 1a into practice. Does Anthony Watts train his disinformers in basic disinformation techniques? Doesn't Anthony know that as publisher, he is equally liable as his "guest essayists" for defamation if someone decides enough is enough? Is he so flushed with the success of cadging a few thousand more dollars from fans in a matter of hours so he can go on a jaunt to the UK that he reckons his readers will cough up again in that eventuality? Maybe so. Within hours of becoming Prime Minister, Tony Abbott shut the Climate Commission. The Climate Commission was an independent body advising the Australian Government on climate change. It was Chaired by Professor Tim Flannery (who was made Australian of the Year by then Prime Minister John Howard for his work in communicating climate science). Other commissioners included leading scientists and others. You can understand why the Commission and its members would be the target of science deniers. Within hours of this happening, the Climate Council was born, rising like Phoenix from the ashes of the Climate Commission. In a show of defiance and anger, Australians all over contributed more than $1 million dollars in only a few days, which was the annual budget of the Climate Commission. The Councillors donated their time for free for the first six months and now receive payment for the time they spend on Council work (corrected by Sou at 6:53 pm 19/7/14). They run a professional organisation with a mix of volunteers and paid employees. They continue to produce the quality work they were known for when the Climate Commission, much to the chagrin of Prime Minister Tony Abbott and Minister Greg Hunt - the two main people promoting fossil fuels and environmental chaos by putting barriers in the way of Australia's shift to renewable energy. Andrew Bolt has been the go to person for Australian climate science deniers for years. He'd make all sorts of false claims and present them in bite-sized chunks so that deniers could use them on discussion boards all over. Eric is doing what deniers have done for years. Building on and distorting lies told by Andrew Bolt. Eric Worrall didn't write a Gish Gallop this time (though he says he linked to one), so it's fairly easy to demolish his disinformation. Flannery has an impressive track record of being wrong. He repeatedly predicted Australia was now in permanent drought, shortly before Australia experienced so much rain, alarmists blamed the Aussie downpour for a drop in sea level. Eric didn't link to any factual information though. Instead, having learnt Disinform Lesson 1a, he linked to the handsomely paid science disinformer Andrew Bolt. PROFESSOR TIM FLANNERY: We're already seeing the initial impacts and they include a decline in the winter rainfall zone across southern Australia, which is clearly an impact of climate change, but also a decrease in run-off. Although we're getting say a 20 per cent decrease in rainfall in some areas of Australia, that's translating to a 60 per cent decrease in the run-off into the dams and rivers. That's because the soil is warmer because of global warming and the plants are under more stress and therefore using more moisture. So even the rain that falls isn't actually going to fill our dams and our river systems, and that's a real worry for the people in the bush. If that trend continues then I think we're going to have serious problems, particularly for irrigation. So if predictions of climate change are correct, what it will mean for a farmer in the winter rainfall zone across southern Australia, is that Professor Flannery thinks that we're going to have serious problems. That's supported by science. Nowhere on did Professor Flannery predict that Australia was in permanent drought. There is usually some part of Australia in drought and science shows that droughts have been getting worse. Professor Flannery in that interview was talking about the drought at the time, the Big Dry and what the future is expected to bring over coming decades. And he was proven right even in the short term. Even before he spoke to Landline, some towns had run out of water. You can see that water levels were low for most of the 2000s. There was a recovery from 2003-05 then things got really, really bad from 2006. April 2009 was a low point, with the dam virtually empty. Farmers here told me they were using bore water to shower, because their rainwater tanks and dams had all run dry. 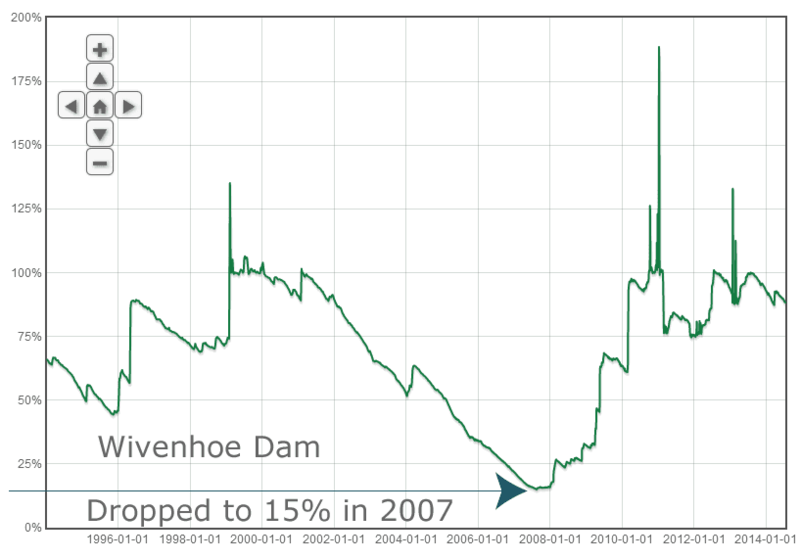 The dam didn't recover until the Big Wet in 2010-11, three and a half years after Tim Flannery's landline interview. Not satisfied with making up stuff about "permanent drought", deniers typically attribute super-status to Professor Flannery, saying that he caused different states to build desalination plants. They are wrong. Desal plants were built because governments were battling a water security crisis. Perth in Western Australia, for example, relies on desalination for almost 30% of its water. Does Eric Worrall tell you that? Not on your nellie. The Victorian government was so concerned about the risk to Melbourne's water supply during the Big Dry (particularly 2007 to 2009), that it built a pipeline and did a deal where it pumps water from the food bowl of Victoria, across the Great Divide to replenish supplies for Melbourne when needed. It also built a monstrosity of a desal plant on terms that arguably could have been much better. But people will complain less when its used for water. It has only been ready since December 2012. It almost certainly will be put to use sometime in the next ten years and thereafter. And you cannot blame Tim Flannery for decisions of the Victorian Government. 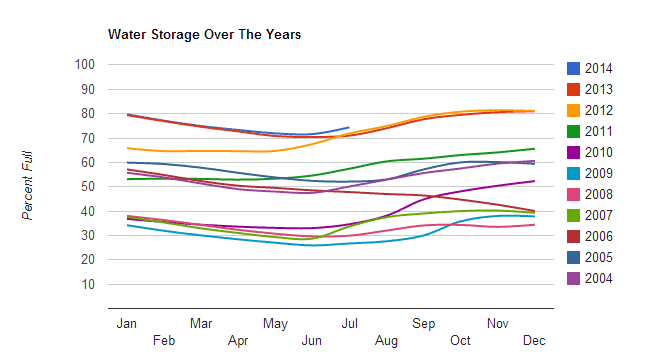 The chart below shows how fragile Melbourne's water storage can be, despite the huge capacity of the Thompson Dam (which is interesting in its own right because filling it caused earthquakes). Thing is, that deniers are playing a very dangerous game. And I expect they know it. When water storages get too low, the risk is not just that supplies will run out altogether, it becomes very difficult to manage water quality. Many towns had "boil water" mandates during the drought as well as severe water restrictions - no water for the garden, no water for car washing, no water for anything but cooking and cleaning - and make sure you boil it before drinking it. That means that less water is flowing through the pipes so microorganisms can build up. Because of the water shortage, people connect water tanks to their supply system without preventing backflow (illegal but done), providing another route for pathogens to enter the main supply. The other danger is from fires, which tend to be worst during droughts. When dams dry up then the helicopters and firefighting tankers have few sources for picking up water to fight the fire. Householders can't rely on tap water to douse embers and put out flames. They may turn on the tap and realise there's no water but that it's too late to flee the fire. After a fire, water supplies can be contaminated by falling ash and debris washing into the system from the burnt water catchment. We couldn't use water for some time after the fires here. When all those factors combine, and I fully expect they will over coming decades, then communities in affected areas will be seriously affected. Believe it or not, Eric even links to a complaint that Tim Flannery points to problems because of the higher temperatures in parts of cities from the urban heat island effect. You know how deniers go on and on pretending that they didn't learn about UHI from climate scientists themselves. Now they are up in arms that Tim Flannery suggested it can adversely impact health and human behaviour. People get more than a tad cranky during heat waves and crime stats go up. More people die in heat waves too, and ambulance services and hospitals are stretched. The biggest problem in cities where the UHI effect comes into play is that it doesn't cool off at night time. That's a known problem and will get worse as the world warms. A veiled message to Anthony Watts to "try getting a job"? Now the following comment from Eric comes only a day or so after Anthony Watts begged for more money (again) than people already give him in his tip jar, so he could take a jaunt to the UK on the pretext of attending two one hour lectures - by people who give public lectures in the USA, mind you. If Flannery is short of cash, perhaps he should try getting a job, rather than holding his hat out for other people’s cash, while taking a walk along a photogenic beach. He should certainly stop pretending he has any skill at predicting the future. The Climate Council needs funds to continue its excellent job. Anthony Watts does a woeful job, but feels like a holiday. The Climate Council produces brilliant reports and helps keep the media spotlight on climate change. Anthony Watts barely reports anything from the trips his fans pay him to take, hardly anything at all. The best he did last time was post videos provided by AGU13 and tell people what a superhero he was for braving a scientific conference, with 20,000 other people. He didn't have to go to the Fall Meet to do that. Nothing worth repeating. Probably not anyway. I gave up after the first couple of "flim flam flammerys". Mindless morons the lot of them. Anthony got what he wanted - lots of clicks from conspiracy theorising nutjobs like Eric "eugenics" Worrall. It's just a long list of people calling for the head of Professor Flannery and buying into the lie that he made flawed predictions. They probably think that the world is about to cool if they wait a bit longer. "The Councillors donate their time for free." "After the first six months, our Board decided that Councillors would receive remuneration for time spent on Council activities. This ensures we can continue to draw on the knowledge and experience of world-class experts to provide Australians with the best possible information on climate change." Now we've sorted that out, have you got a comment on all the mistakes that Andrew Bolt and Eric eugenics Worrall and Anthony Watts are perpetuating? I guess it all comes down to individual perspective as to what constitutes a mistake. You say that Anthony is begging for money BUT.. "The Climate Council needs funds to continue its excellent job". I could just as easily say that Anthony needs funds to continue his excellent work and Tim is begging for money, through the climate council, to maintain his lifestyle. Anthony seems to have at least two jobs - reading the weather on a Fox affiliate radio station and selling his weather gadgets. So it is a bit rich asking his acolytes to fund his trips. No, I'd go so far as to say he's taking them for a ride. You're right, Skeptikal. Neither Anthony Watts or Eric Worrall or Andrew Bolt made a mistake, I was using a euphemism out of deference to deniers desire for political correctness. (See my upcoming article.) They are deliberately making stuff up to feed the fantasies of the run of the mill dumb denier. As for your bit about excellence, yes, it's obviously just as easy for you to say that. It only takes a few mouse clicks. I wouldn't expect you to say anything else. I, on the other hand, would find it very difficult to say that because I have standards and suffer a conscience. Another thing, you can argue the point about "excellent job" with Wondering Willis Eschenbach, who thinks Anthony Watts is as dumb as an ox and WUWT is full of complete and utter rubbish. If that's what Anthony aspires to, and he didn't dispute Willis, then he is indeed doing an "excellent job". So I would have no difficulty finding it easy to say that, but only by using Willis' definition of what the job is. There would then be no conflict between us. The Climate Council is doing an excellent job of communicating the science. Anthony is doing an excellent job of peddling complete and utter nonsense. You can pay for your nonsense and Anthony's holidays (expecting nothing in return) while I'll support sense and science and expect reports of a high standard. Catmando, I think Anthony sees WUWT as part business venture part service to the denier cause. I don't mind him asking people to fork out. I don't have any strong exception to panhandling or begging. As Skeptikal points out it's a matter of degree and people can judge what they are paying for. A holiday for Anthony or ongoing high quality reports and communication from the Climate Council - or next week's rent or mortgage payment or vegemite sandwich. Worral is really plumbing the depths with this recycling of a definitive bit of Boltian disingenuity. Bolt repeats this slur numerous times a year, it's obviously masturbatory for him.
" One of the first lessons disinformers learn is how to cherry pick. That means taking anything from one word to ten from a blog article, a stolen personal email, a scientific paper or even from a video transcript and putting them in a different context of your choosing. In other words, distorting at best but usually making something up altogether and then falsely attributing it to the person you want to misrepresent or defame." This is actually defined as "quote mining", perfected by creationists in the United States in the last half of the 20th century. Thanks, Dhogaza. You are right. I probably need a glossary to work through the techniques used by disinformers.